The mystery surrounding this poem by world champion boxer Muhammad Ali, delivered at a Harvard graduation ceremony and the shortest poem in the English language, is today back into the limelight. Accountability, a side effect of corporate and social transparency, is the only way to make a difference. Accountability is driven by the Me, the individual, because every societal change, every move towards making things better, starts with a personal commitment to see any action through. Facts, who always speak louder than words, is what pushes this sentiment forth. The Me movement has been executed by individuals who rose the alarm bells when corporate malpractice tarnished companies’ activities, individuals who uncovered politicians’ deceit to the public, people who sprang leadership, vision and a way to move forward for the We, the Us, the Everybodies. Corporate and social leaders need to address how their Me fits into the We. Too many CEOs continue to be obscure figures to many customers even though transparency is filling the hearts of the public demanding to see ‘the faces behind the brand’. For Me to become We, one has to lead by example. Alignment, respect, and above all, a sense of common destiny is beginning to emerge in society. The towers that we built in the previous century have fallen destroyed by our very own actions and carelessness. A new society is being built at present. This self-sufficient society, as individual as ever, has surprisingly grown a conscience. It has done so because the pain of the world is now publicly exhibited in the media broadcasts around the world and, this time, its cries have not fallen on deaf ears, the ears of the capitalistic society of the 1980s, or the technology inebriated era of the 1990s. 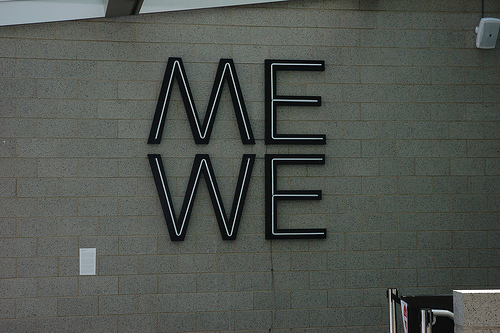 The collective consciousness wants the MEs to become WEs because together we shall persevere. The Internet democratized society knows no social strata: equality is empowering the Me today, hence its rise to leadership seems like a natural path to take when the vision is shared across the sentiment of other individuals. Me, We. All of us standing on the same side of the equation, at the beginning of a new decade, one that for the first time in many years, demands coalition, unity, all for one and one for all peoples.